The 997 GT2 RS is the fastest and most powerful road-going sports car ever built in the history of Porsche. With horsepower up by 90bhp and weight down by 154 lbs (70 kilograms) in comparison with the previous model, the 911 GT2 RS has a power-to-weight ratio of just 4.9 lbs (2.21 kg) per horsepower, by far the best power/weight ratio in its class. These are the ideal ingredients for an Ultra-high-performance sports car with supreme agility and truly blistering performance on the road. The 3.6 litre six-cylinder boxer engine features two variable turbine geometry turbochargers and provides power to the rear wheels exclusively through a six-speed manual gearbox. Tyres were specifically developed for the 911 GT2 RS and measure 245/35 ZR 19 at the front and 325/30 ZR 19 at the rear, delivering cornering performance to match the straight-line speed. Extreme cornering dynamics are ensured by the setup of the springs, Porsche Adaptive Suspension Management (PASM), unique anti-roll bars, specific engine mounts and recalibrated Porsche Stability Management (PSM), whose stability and traction control functions can be switched off individually. The combined effect of these developments is evident on the racetrack. In fact, the ultimate 911 accelerates from 0-60 in 3.4 seconds, boasts a top speed of 205 mph and laps the famed Nürburgring-Nordschleife racetrack in just 7 minutes and 18 seconds. The unique looks of this limited production 911 GT2 RS stands out clearly from the other 911 models through the lavish use of carbon-fibre-reinforced components with a matt-black surface finish, even wider wheels (including flared wheel arches at the front), new light-alloy wheels with central locking and “GT2 RS“ model designations on the doors and rear lid. Matte-finish carbon also graces the redesigned front spoiler lip and the 3/8th of an inch (10 mm) taller rear spoiler lip – which both enhances aerodynamics and provide extra down force. contrasts with red elements, such as the seat centre sections, the roof lining and segments of the steering wheel rim. The gearshift and handbrake lever are also finished in red alcantara. 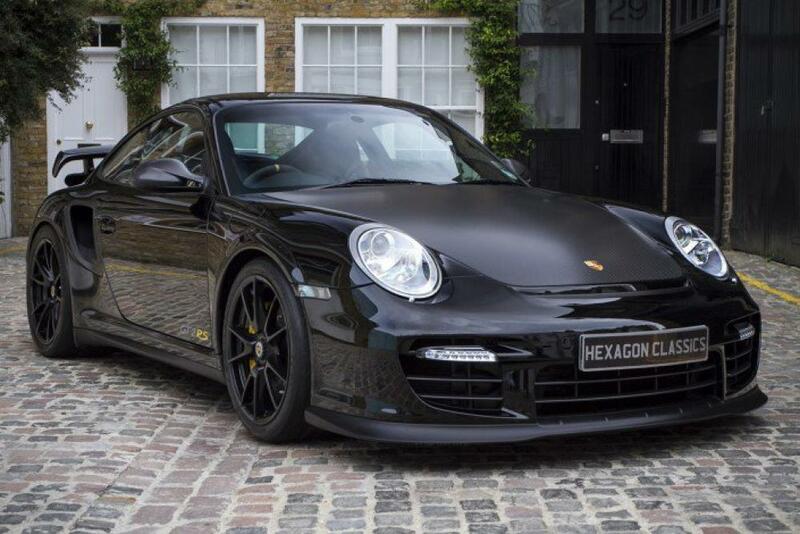 This is a unique opportunity to acquire one of Porsche’s most highly collectable contemporary road cars, finished in Black, only 19 RHD models have ever built & with only 4,700 miles from new, this 997 GT2 RS must surely be regarded as the most awesome Porsche 911 ever built. Video below just released by EVO magazine – where the 997 GT2 Rs beats in a track battle – Mclaren MP4 12c/Merc SLS Black and a 991 GT3!